5 Questions that help make the right choice. Bitting is a complicated topic, but I hope to make it a little easier for you to ask yourself the right questions. The answers to those questions can then be your guide to finding the right bit. What lies beneath (the muzzle)? The muzzle is a sensitive, complex part of the horse’s sensory system. In the best case scenario – suitable bit and sensitive, light hands – it is therefore also a perfect ‘communication hub’ between rider hand and horse brain. In the worst case scenario – the wrong bit and rough rein influence – it becomes the scene of torture. How wide is your horse’s lower jaw? How concave or flat is the cavity of your horse’s palate? What is the angle/shape of your horse’s ‘bars’ (the toothless lower part where the bit rests)? Is it shaped like a roof, with a small contact area? Or is the contact area flat, wide and fleshy or anything in between? How thick is your horse’s tongue? Last not least: Any old injuries/scars/odd tooth arrangement or presence of ‘wolf teeth’? Lift your horse’s lip, feel around, carefully grab the tongue, stroke over the bars, touch the palate and explore its shape, open your horse’s mouth and observe any visual clues. In other words: familiarize yourself with the landscape of your horse’s mouth. What does the exterior of the muzzle look like? After you have explored the inside of your horse’s mouth through palpation and visual exploration, it is time to look at the outside. 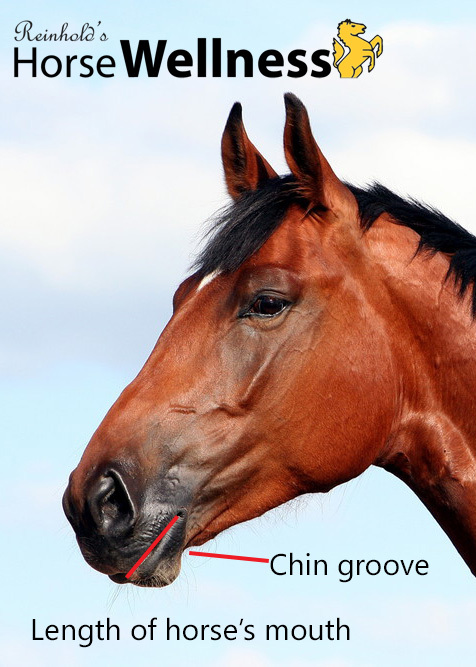 How long is your horse’s mouth (meaning the opening, where does the corner of the mouth end relative to the nostril)? Do you notice any chafing or cracking, warts, or scarring? How deep is the chin groove? How fleshy is the muzzle? What is the horse’s personality? Energy level: Anything from laid back or ‘pokey’ to forward and energetic. Rate your horse on a scale from 1-10, with 10 being the highest energy level. Strong-mindedness: Even with the best of training, there are horses, who insist on their own agenda more often than other, more agreeable types. It is important to be realistic about this. (No excuses! Bad training does not count!) Rate your horse on a scale from 1-10, with 10 being the most strong-minded. Sensitivity: This plays a bit into the physical make-up and also the history of the horse. A former school horse can be quite dull in the mouth (mentally and physically), another horse has lots of sensitive nerves and reacts to the smallest closing of the hands. Rate your horse from 1-10, with 10 being the most sensitivity. NOTE: If you are unsure because the horse may be new to you, take your time and enlist the help of a friend or trainer to gently and respectfully explore the respective area with your horse. What is the horse’s job and training level? Considering the horse’s riding discipline and training level is key. Rate your horse on a scale from 1-10, with 10 being the highest level that can be attained in your discipline. What can be expected by the rider? What type of rider will handle this horse’s reins? Rate the skill level as it pertains to a) independent seat and b) careful and sensitive use of the reins and soft hands, on a scale from 1-10, with 10 being a very balanced rider with skilled, soft hands. A young horse and/or a horse with little training should have the gentlest bit possible. The Herm Sprenger Dynamic RS snaffle bit, for example, can be a good choice. Bits with leverage or double bridles only belong into the mouths of horses with the appropriate training level and under a skilled rider. Rider safety is first. If you ride competitive trail or endurance, for example, and you have a high-strung animal, you need to take this into consideration. And yes, bits sometimes do stop horses. A simple snaffle bit of some type will do fine for most applications – from dressage over trail riding to show jumping – if horse and rider are appropriately trained. The best-fitting bit can become an instrument of torture under a tight noseband. Broken snaffle bits (French link, for example) are not necessarily gentler. It depends on the horse! TIP: For horses with difficult mouth anatomy (thick tongue plus narrow jaw and low palate, for example), or horses with learned bit aversions, try a Meroth leather snaffle. Be sure to not purchase ‘copy cat’ products, as they may contain toxic tanning agents. And only the Meroth bit is 100% leather without steel or plastic core, therefore extra gentle. Write the results of you explorations on a sheet of paper. Also list your concerns and questions, then contact several bit experts and ask what bit they would recommend for your particular horse and situation. Chose the bit and answer that makes the most sense to you. Your horse will be the last judge! As always, be well and enjoy your horse! 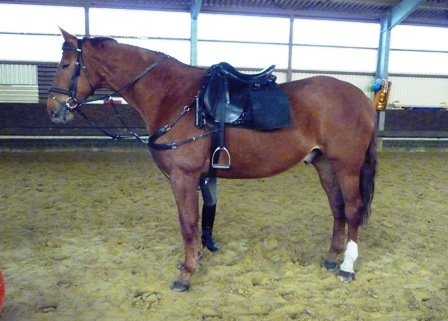 Is a leather snaffle right for me and my horse? On rope halters, hackamores, bitless bridles—’natural’ or potentially harmful? WARNING: This article was posted 4 years ago. Experience now proves that this article may send some readers into a flying rage or emotional outburst, which is then expressed in very long emails or comments to this post. All comments to this post are approved by me and I will gladly approve differing opinions, but not negativity and outbursts. PLEASE read this article with an open mind. Its basic message is: Rope halters, hackamores, bitless bridles are generally NO more gentle nor ‘natural’ to the horse and can – just like a bit – cause injury, pain, discomfort, stress in the horse. The solution: Learn how to ride with a light hand and an independent seat to do right by your horse. Learn proper training techniques that work without pain coercion. Please also note (and see picture): I DO USE A ROPE HALTER when indicated, on both my horses and rehab horses in the past. A rope halter on an appy mare I rehabbed.This brief introduction will hopefully help put things into perspective for those, who are on the defensive right after reading the title. As the horse world is evolving and people across all disciplines are striving for a generally more humane approach to horsemanship—focusing on relationship and gentlenss—there has been a shift from traditional halters, bits and bridles to alternative solutions that are perceived to be more ‘natural’. Apart from the fact that I don’t believe there to be anything ‘natural’ about riding, driving or otherwise using horses for our purposes in the first place, I want to question the ‘naturalness’ and also the humanenessss or gentleness of some of these devices. Let’s do a bit of semi-scientific investigation of halters, bridles and other tools commonly used to restrain and control our horses or to simply ‘keep him in the neighborhood’. 1773 users give this halter 5 stars. Excellent! We can conclude that the halter keeps its promise: Absolute control via pressure on sensitive facial nerves results in desired results for the handler. What does it mean for the horse? The horse’s face is lined with a network of sensitive nerves that exit the skull around the middle of the face and extend into the muzzle. There is also an abundance of nerves right behind the ears, a very sensitive area. Note: This is where stallions bite during their stallion fights, they know it hurts! Let’s embark on a little practical experiment to understand what this may feel like: Find an area of your own body that is bony, meaning having little flesh between bone and skin, and has a lot of nerves, for example your shin. Sit comfortably on a chair and put your leg up on another chair. Now take a rope halter with the knot on your shin and and attach a weight of about 2-3 pounds (about the weight of a 22′ longe line with brass buckle) on it for about 30 minutes. Keep tugging on it to simulate the effect of a handler adding some pressure to the weight of longe line and brass buckle. If you have a 22′ longe line with brass buckle, feel free to weigh it before the experiment, just to make sure we get it right. Do the exact same thing on the exact same spot the next day and the day after. chronic tension in the poll and TMJ. My thoughts: There may be a place for the short-term, responsible application of rope halters in combination with an attached, light-weight lead rope without buckle (I purchased such a halter in Montana in 2007 and still use it on occasion.) 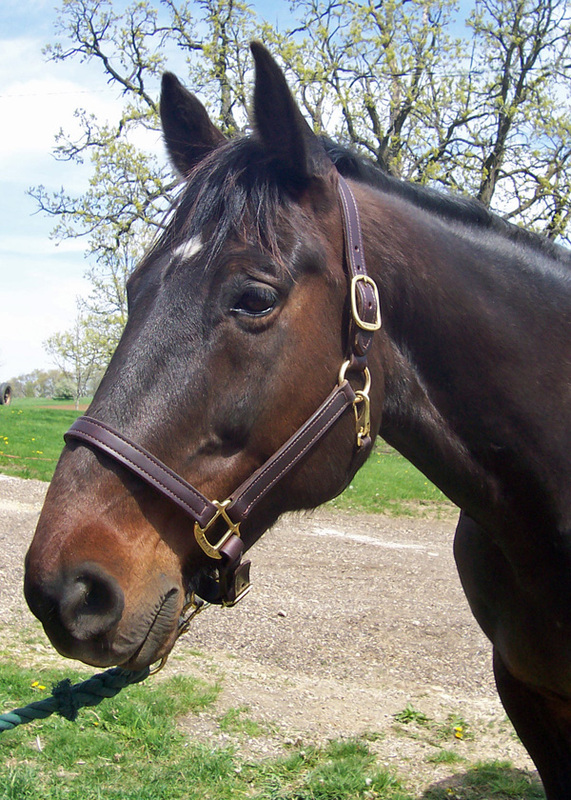 For every-day use, a flat nylon webbing halter with leather break-away head piece or a flat leather halter is the humane method of handling your horse. a) bodywork or b) longing. A) It will cause occasional discomfort and distract the horse from the bodywork. B) Unless in cases of extreme behavior challenges and for short-term, special-case application, you will want to use a flat halter, a longe caveson or even a bridle with a gentle bit for longing. All this is more pleasant to the horse and will enable him to move freely without pain. My Paladin modeling a leather halter. A hackamore works along the same principles as a rope halter. It puts strong focal pressure on very sensitive areas of the horse’s face. It is NOT a more humane solution than any kind of bit. Rather, it’s meant for a skilled and knowledgable rider/trainer, who can work with this tool to increase the responsiveness of a horse. If you don’t have ‘breaks’ on your horse, a hackamore will NOT be a good solution, only a very painful fix for a deeper training issue. If you are not experienced in the use of a hackamore, get an experienced trainer’s input and advice, to see if you and your horse are ready for a hackamore. Even though softer and with less focal pressure, the bitless bridle works along the same lines as above. In addition, some styles constrict the horse’s head, a feeling that is so unpleasant to the horse that it will strive to be obedient to avoid this feeling. If you are planning to use a bitless bridle, observe your horse carefully. 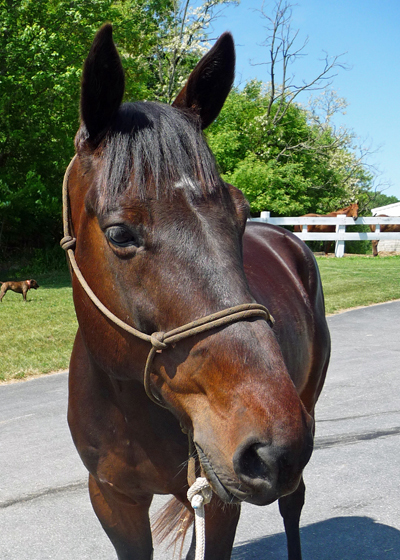 If the desired effect (obedience) comes with wide eyes and a raised head, it’s not working for your horse. The horse’s face, head and poll area is lined with ultra-sensitive nerves. Rope halters, hackamores and some bitless bridles enable the handler to use a pain response to control the horse. Pain-based control tools can result in behavior and physical issues (see examples above). They seem to temporarily solve control problems, but your horse will pay the price in the long run. Re-examine the tools you are currently using. decisions around the use of so-called ‘natural’ tools. Put yourself in your horse’s shoes, visualize or physically try the tool on yourself and then restrategize, if needed. There is no substitute for proper training. If you feel you need more control, find a trainer that is in line with your own general philosphy, even if it’s against the ‘popular belief’. 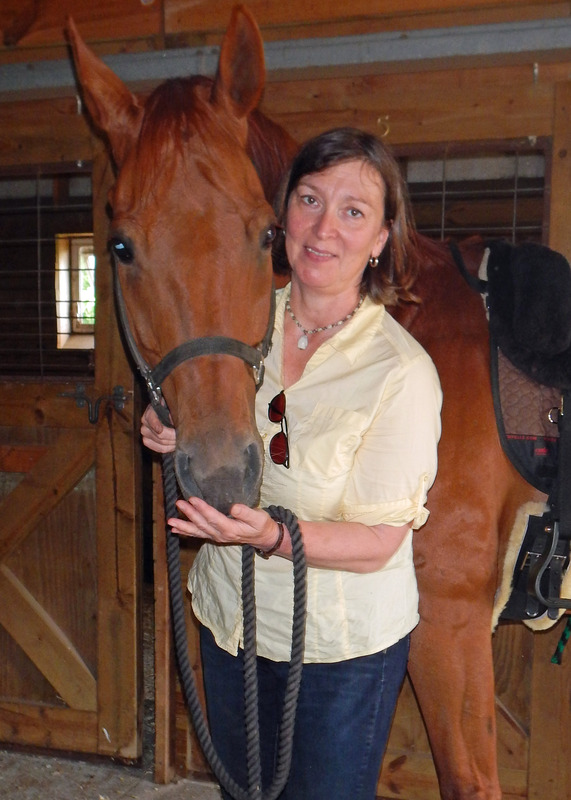 Stefanie with an Arabian in a flat webbing halter for bodywork. 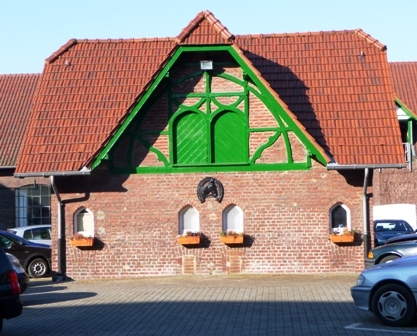 When it was clear that I needed to travel to Germany short notice due to family circumstances, I knew that I wanted to take the opportunity to visit the State Mounted Police North Rhine Westphalia, formerly home and training ground of Klaus Balkenhol, police officer and Olympic gold medalist from my home town Düsseldorf. As I provide rider training for the Mounted Police in Madison, I was interested in learning from the German troop and was looking forward to much inspiration. My excitement grew when I found out I was welcome to attend a training session of the ‘Landesreiterstaffel’ on Tuesday 3/9. 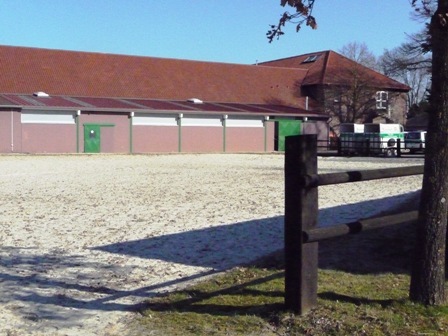 The troop is renting space in a wonderful old equestrian property about a ½ hour drive from Düsseldorf. Two police Sergeants in charge were helpful to show me around and answer all questions I could think of. It soon became clear that this troop faces extreme challenges and horse and rider fitness are of special importance. Mounted police in Germany face different challenges in comparison to the US officers (at least in Madison) on horse back. In Germany, the average mounted police officer carries a short rubber stick as a weapon. Guns are not always carried and the laws governing the use of such guns are much different from US laws. Crowd control takes on a different dimension where hooliganism and riots are an expected part of large soccer games and political protests. Civilians often come into close contact with horses and riders and riders must therefore wear respective protective gear. Protesters are savvy and come prepared to face the Mounted Police by throwing beach balls at horses or rolling barrels towards horses and riders. On duty, for example when large crowds of disgruntled fans of a losing soccer team must be controlled, burning garbage cans or gasoline fires must be expected. “Our police horses go through fire and paper walls,” Sergeant Gräfen explained, “we train them to tackle these obstacles by finding one horse that will do it, the others then follow quite easily.” Desensitizing is mostly done while mounted. Of course this is a matter of trust between rider and horse, a basic principle of the classic German cavalry guidelines, which form the basis of today’s FN-guidelines. He shows materials used to construct obstacles, such as wooden frames with holes for tar torches and wall paper with brick design. A metal barrel filled with rocks, which is rolled towards the horses, is also part of the training equipment. Obstacles courses change during the weekly training sessions, which always incorporate a substantial warm up phase. The training of horses and riders adheres to the classical German training scale as far as gymnasticizing and obedience is concerned. 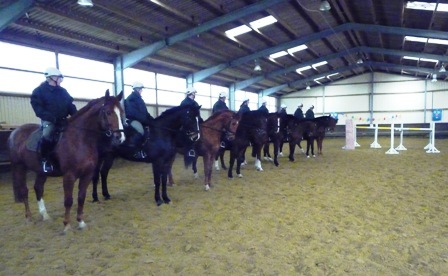 The riders also have seat lessons on the lunge, when needed and several officers are trained riding instructors. 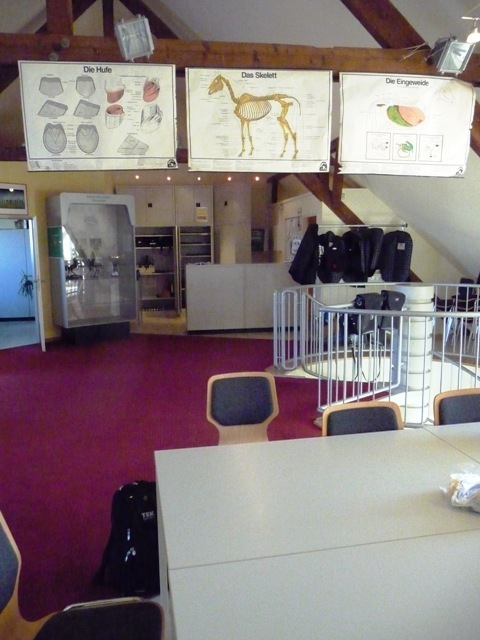 Riding theory and horse anatomy are routinely taught in the bright and friendly training room. All officers are required to pass the ‘Reiterabzeichen’ (rider’s test required for participation in shows) in bronze. All horses and riders are at least trained to level 2 in dressage and jumping. The times of Klaus Balkenhol, where police officers were competing in shows in uniform however, are over, according to Gräfen. “We just don’t have the time any more. There is too much work to do,” he says. The big ‘Karneval’-Parades in Cologne and Düsseldorf are just behind them. This week, they are making plans for a large soccer game in Cologne, where riders and horses are hauled to protect feuding mobs of fans from each other and the general population from both and then off to the annual Kurdish protest event in Düsseldorf the next day, where 40,000 protesters are expected to flood the streets of a city with 500,000 inhabitants. Equipment is a factor as well. 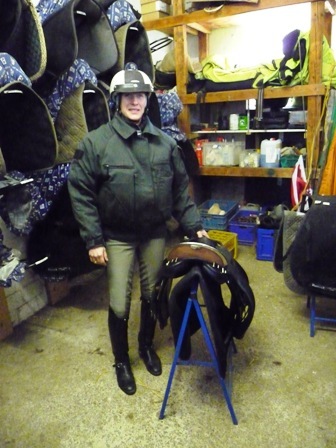 The horses are ridden in Stübben “Country” saddles and Equitex pads. Here and there, the traditional ‘Woilach’, a folded military saddle blanket, is still used. One is moving away from the double bridle now and mostly rides in a snaffle bit. The psychological effect and resulting effectiveness of mounted police is also an important aspect. “When working neighborhoods and parks, the presence of horses alone can make all the difference. People are more likely to approach an officer on a horse than an officer on foot or in a car,” says Gräfen. Many things sound familiar to me. In Madison, we don’t have protests with 40,000 participants and football fans do not routinely set garbage cans on fire and try to pull officers off the horse, but we, too, know the value of the mounted police officer in troubled neighborhoods, on less trodden paths in public parks or along the train tracks. Crime prevention, accessibility/friendliness factor and crowd control are the three biggest strengths of mounted units. And – this is my hope – maybe soccer will grow in popularity in the US, after all? Goooaaal!!! By the way: There was sooo much more I learned about their training, but it’s just too much to squeeze into this article. Drop me a line, if you are interested or have your own mounted police training experience to share.